When my salary stops, how do I draw an income in retirement? Retirementor and CFP® Pat Blamire is asked this question so often by her clients. From years of planning for their future security, she understands that clients need to know exactly how drawing an income from their retirement savings works … for their peace of mind. Her article which follows here explains exactly how this happens. Monies that you earn after tax, and save in different investments such as fixed deposits, unit trusts, endowments or tax-free savings accounts. We refer to such monies as your “liquid investments”. The balance between liquid investments and non-liquid investments in retirement is within your power, and is a very important decision that needs to be made. Your Retirement Specialist will help you make this decision. 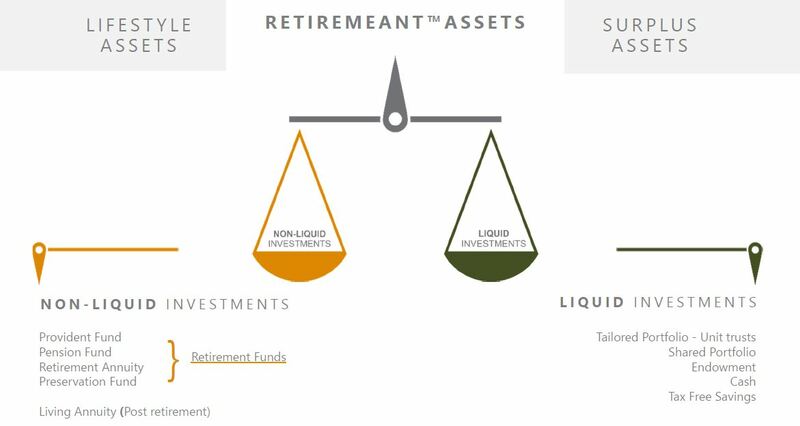 This graphic may help you understand the difference between the two types of assets. Your “non-liquid investments” have certain rules and regulations, and are not flexible. Your “liquid investments” are usually flexible, and, in retirement, are used to provide you with lump sums, say, to purchase replacement motor vehicles, pay for holidays, and can be used to top up your monthly income. At retirement (any time after age 55), you can retire from your “non-liquid investments” and start drawing an income from these retirement savings. To encourage people to save for their own retirement, tax legislation allows certain tax relief on lump sums that you draw from these investments: the first R500,000 of a lump sum is tax free; amounts between R500,001 and R700,000 are taxed at 18%; amounts between R700,001 and R1,050,000 are taxed at 27%; and amounts in excess of R1,050,001 are taxed at a flat rate of 36%. You can then use the untaxed portion of your “non-liquid investments” to buy yourself either a Compulsory Annuity or a Living Annuity. A Compulsory Annuity is provided by an insurance company or your company retirement fund, and they undertake to provide you with an annuity (pension) for the rest of your life, and usually for your spouse also (in most instances, the spouse’s pension is reduced to 75% of your pension). When the surviving spouse dies, this pension then dies with them. A Living Annuity is an annuity (pension) where you decide how much income you want to draw from your “non-liquid investments”. Legislation requires you to draw an income of between 2.5% and 17.5% per annum of your Living Annuity, and this is paid to you monthly. On your death, your surviving spouse (or beneficiary) will have the choice of either continuing to draw an income from your Living Annuity, or cashing it in, and receiving a lump sum, after-tax amount. As your Living Annuity is untaxed money, if a beneficiary decides to cash it in, these monies will be taxed before being paid out to them. No monies are ever left behind in a Living Annuity after your death, and will always be paid out to your beneficiaries. Income drawn from either a Compulsory Annuity or a Living Annuity is taxable in your hands, and taxed according to the tax tables. Investment growth within a Living Annuity is taxed at 0%, and it is therefore a very tax efficient investment vehicle. On your death, it does not form part of your estate for estate duty purposes. These are very important decisions to be taken when you get to retirement, and your retirement specialist will guide you through this process. Felicity is no longer with us, but I am so glad that she and Thomas took these trips and that they had such fun in planning them. Whilst Thomas misses Felicity terribly, he at least has the memories of these fun times they had. As a financial planner, it is seldom that a conversation with my clients concludes without the subject of their children’s financial stability emerging. As a mother of two sons, I find myself sharing many of my clients’ concerns, even into our children’s adulthood. These concerns, it seems, are with good reason. A US study has revealed a pattern regarding the passing on of wealth within families: the first generation makes the money, the second maintains the money, and, in 90% of cases, by the third generation the money is gone. This gradual decline is captured in the cultural proverb: “from shirt sleeves to shirt sleeves in three generations”. Are there certain practices that we as parents can put into place to help our children create their own financial freedom? How do we balance messages of recognising the importance of money and of guarding against materialism? My son, Ryan is extremely competent, has a strong personality and holds down a very demanding job. I have no doubt that he would cope were I no longer around. Donovan is a gentle man, with a dream of being a missionary … but with a wife and tiny daughter, his idealistic nature is simply not putting food on the table. I worry constantly about how he would manage were I absent. I am fascinated at how some of the younger generation are so capable and competent whilst others are just not ready to take on the responsibilities of adult life. And, of course, proper money management is very much a part of creating a successful career and family in our adult years. 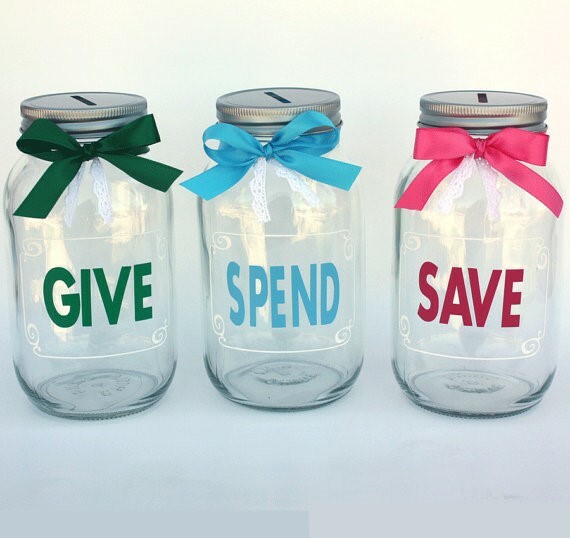 I have distilled from my wider reading some great tips for helping parents create the ‘scaffolding’ for their children to establish a healthy and responsible attitude to managing their money. 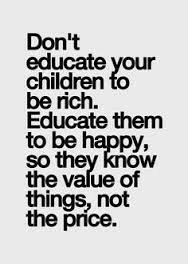 Talk to your children about your values, your money, your life. Do they know what sacrifices their grandparents and parents made to create lives of relative ease, or even indulgence, for them? Do they make a connection between hard work and prosperity? Do they know that work is a great source of a sense of personal achievement? Allow them to be different to you. They have grown up with a completely new set of social norms, even though you have passed on your values. They may, for example, value a variety of jobs over the kind of stability or loyalty you have treasured. That’s OK – their generation is going to live longer and will probably have to be job-nimble. Teach them to be independent. A sense of control over their own lives engenders confidence and a belief that their actions and attitudes impact their world. Model healthy and independent relationships yourself; let your kids know it’s fine to be separate – be alone and sometimes to disagree; seek opportunities to show your own perseverance in the face of difficult tasks. Don’t take their troubles away – they need to work through their own trials and tribulations in order to grow. The Monarch Butterfly needs to force its own way out of the chrysalis in order to strengthen its wings to fly, or it will not be strong enough to survive. Tell the family stories, especially to your grandchildren, of what life was like when you were small – this is the glue that holds a family together, and also helps to maintain the family history for when you are not around one day. Make family memories: give with a warm hand. Plan and share special celebrations together. Imagine a gift that you could give to your children, even your adult children. This gift will enhance their self-esteem, create the foundation for a confident approach to life, and develop skills that will stand them in good stead throughout their lives. This is the gift of being financially responsible. Where does your next lesson lie? 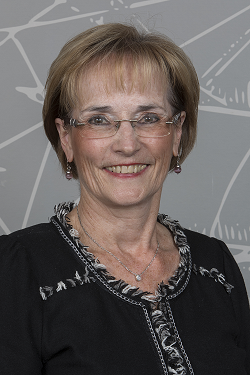 Chartered Wealth Solutions Senior Financial Planner, Pat Blamire, shares her learning journey … and reveals that the best learning of all is perhaps about ourselves and our place in the world. About 20 years ago, one of my mentors convinced me to run the Comrades Marathon. What a daunting challenge, but rich with life lessons. I learned that by slowly setting your mind to the task on hand, training according to a very specific programme, a huge mountain can be challenged and achieved – in this case, completing 89 kilometres between Durban and Pietermaritzburg! This experience taught me to set myself objectives in life, and doggedly go on to achieve them. I subsequently ran a second Comrades Marathon, and then set myself a different objective of starting to study. 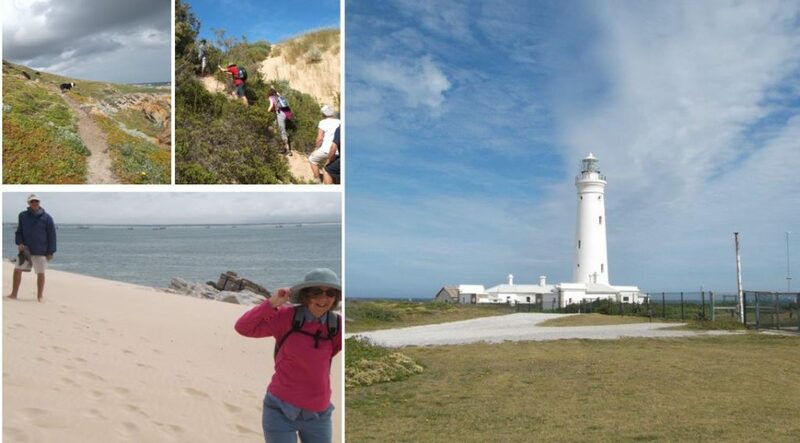 The “next” was an Environmental and Wildlife course, culminating in my obtaining a FGASA Level 1 qualification. What a joy that year was – busy, but learning about things that I didn’t know anything about. It also helped to deepen my love for the bush, and I jump at every opportunity to go back to the bush and learn more – my particular passion is Trees and Birding. I still constantly need an objective to achieve each year, and this can present a challenge when you have achieved those qualifications you want for your career (I had completed the Advanced Estate Planning module in financial planning in 2012). While I still attend seminars and conferences to keep up to date with industry trends, I thrive on acquiring a wide range of knowledge. Feeling uncertain and anxious about options for my next new area for study, I booked a coaching session with Colleen-Joy Page, professional ILS coach and a Retire Successfully Retirementor. She helped me recognise that it is okay not to have to keep ticking off objectives on my list. I so enjoyed the session, and equally benefitted from the coaching days at Chartered with Colleen-Joy. So, my new objective became to complete Colleen-Joy’s Coach course! I knew this would improve my insight in meetings with clients. The course was absolutely wonderful, and such a help in my personal life at the time, as I was going through the transition of selling my house and buying a new home – very scary. The course has helped me to look at the world differently, and to be a more complete person. This is the person that I take into my client meetings, where I try to help my clients through their own difficult decisions and transitions. I have had the mindset of improving my knowledge on various subjects for so long that it has become second nature to me to continue to grow. I do not get as stressed as I used to, and do not feel compelled to keep ticking off achievements on a list. My passion and goal currently is to learn more about inter-generational wealth, and how this can be passed down through the generations, responsibly. This is very close to my career, which I love, and it is my intention to be able to share my learnings with my clients, so that they can teach their children these lessons. 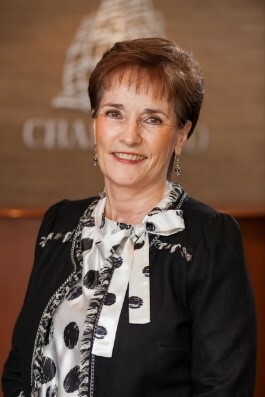 Pat Blamire is a Certified Financial Planner at Chartered Wealth Solutions. She has a Certificate in Advanced Taxation, and an advanced post-graduate Diploma in Financial Planning, specialising in Investments and Estate Planning. 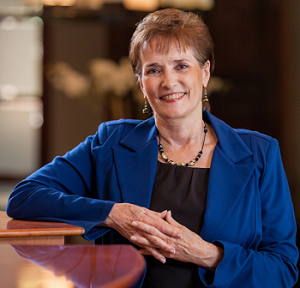 Pat was a finalist in the 2010 FPI Financial Planner of the Year Competition, and regularly appears in the media to share her expertise and insight.